Bright, fresh, and tangy this potato salad is what potatoes dream to be made in to. Serve with Austrian Steak or anything off of a grill, or just eat it on it's own and enjoy the herby tangy goodness. 1.Put potatoes into a pot; cover with salted water by 2". Boil; reduce heat; simmer until tender, 14–15 minutes. Drain; cool slightly. 2. Mix cider vinegar, pumpkin seed oil, and 1⁄4 cup warm water. Add in shallots, and salt and pepper. Toss gently with potatoes in a large bowl; cover and let rest for 20-30 minutes. 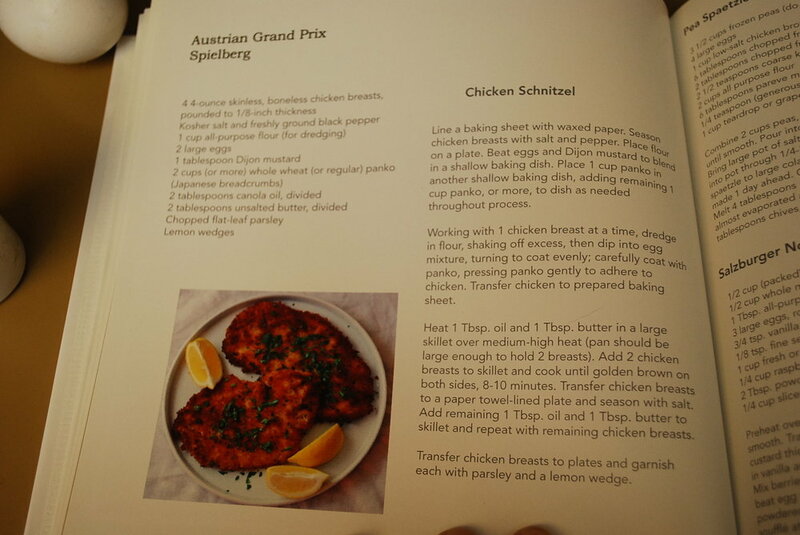 I am consistently surprised and impressed with Austrian recipes and dishes. I had such a hard time choosing a recipe, there were so many amazing sounding options to choose from. Also, I found on my shelf a classic of American cookbooks, the TIME cookbook series: The Cooking of Vienna's Empire (!) Although there were some tempting options in there I went for something a little more contemporary... or at least updated. I am also tempted by the Hungarian Goulash's in this classic cookbook, but those will have to wait until the Hungarian GP! 2. Mix cider vinegar, pumpkin seed oil, and 1⁄4 cup warm water. Add in shallots, and salt and pepper. Toss gently with potatoes in a large bowl; cover and set aside. 3. Pour canola oil into a pot to a depth of 2"; heat over medium-high heat to 350°. Put 1 cup flour into a bowl. Toss a handful of onions in flour and shake off excess; fry until golden, 3–4 minutes. Using a slotted spoon, transfer to a paper towel–lined plate; season with salt. Repeat with remaining onions. 4. Working with 1 piece of beef at a time, pound it between 2 pieces of plastic wrap with a meat mallet until 1⁄4" thick. Put 1 cup flour in a shallow dish. Season beef with salt and pepper; coat only one side of each piece with 1⁄2 tbsp. mustard. Dredge mustard side in flour; shake off excess; transfer to plates. 5. Heat 3 tbsp. canola oil in a skillet over medium-high heat. Add half the beef; cook, turning once, until browned, 4–5 minutes. Transfer to a plate; keep warm. Clean out skillet; repeat with another 3 tbsp. canola oil and remaining beef. 6. Return skillet to medium heat; whisk in remaining flour; cook for 30 seconds. Whisk in broth; cook until thickened, about 2 minutes. Remove from heat; whisk in butter 1 piece at a time. To make smooth, strain sauce into a bowl. Stir in balsamic vinegar; season with salt and pepper. 7. Serve steaks with sauce and onions alongside the potato salad garnished with parsley. The Linzer Torte was inspired by every website, book, or person I talked to about Austria, so I knew I had to make it. I remembered, somewhere in the back of my mind, that Smitten Kitchen shared a Linzer Torte recipe a few years ago, and as usual she did not disappoint. Austrian Grand Prix - Red Bull Ring in Spielberg Austria. 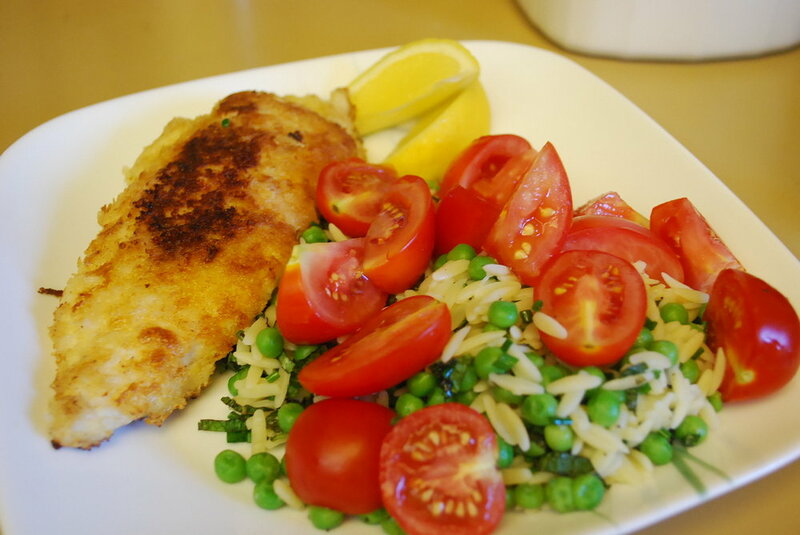 We didn't get a chance to make Schnitzel last year, too much summer travel to fit in all the recipes. I hadn't even planned to make it this year, thinking it would be complicated or take too long. I was wrong! So easy, so quick, so delicious. Such a basic recipe, yes... there are a lot of plates used, but that is the only thing that could be considered complicated. Pound out chicken breasts with rolling pin (wrap in plastic wrap or wax paper to reduce chicken mess). Place flour on a plate. Beat eggs and Dijon mustard to blend on a high rimmed plate or low baking dish. Place 1 cup panko in another plate or shallow baking dish, adding remaining 1 cup panko, or more, to dish as needed throughout process. 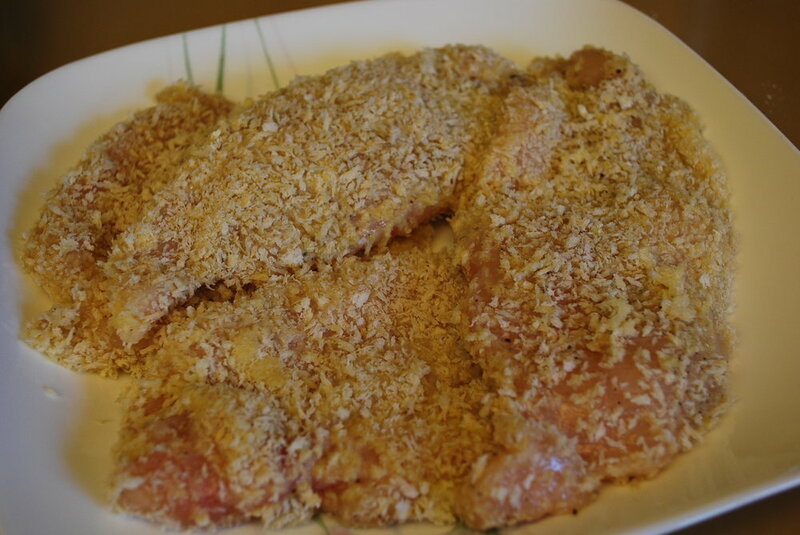 Working with 1 chicken breast at a time, dredge in flour, shaking off excess, then dip into egg mixture, turning to coat evenly; carefully coat with panko, pressing panko gently to adhere to chicken. Transfer chicken to final plate. Heat 1 Tbsp. oil and 1 Tbsp. butter in a large skillet over medium-high heat. Add chicken breasts (as many as fit) to skillet and cook until golden brown on both sides, 8-10 minutes. Transfer chicken breasts to a paper towel-lined plate and season with salt. Add remaining 1 Tbsp. oil and 1 Tbsp. butter to skillet and repeat with remaining chicken breasts as needed. 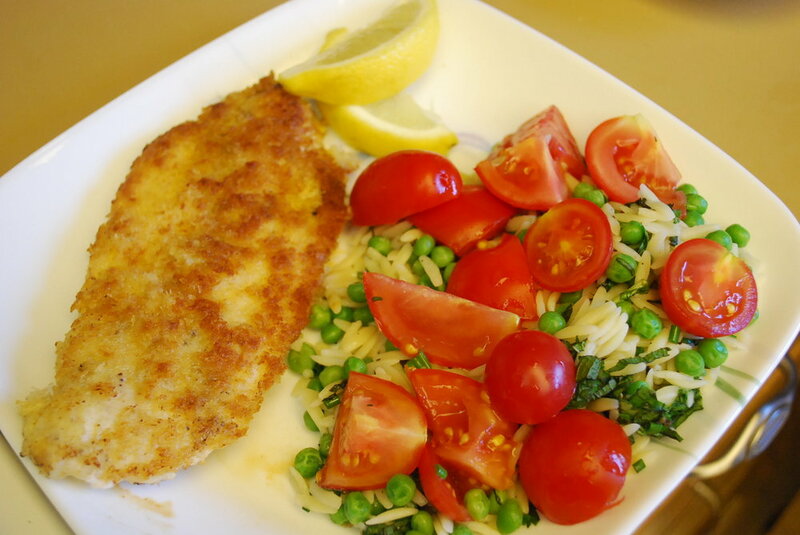 Transfer chicken breasts to serving plates and garnish each with parsley and a lemon wedge. Cook orzo in large pot of boiling salted water, stirring occasionally. One minute before preferred doneness add frozen peas to pasta, cook to just tender. Drain peas and pasta. Rinse briefly under cold water; drain well. Transfer to medium bowl; cool slightly. Can serve warm or cool. Whisk lemon juice and olive oil in small bowl. Mix in salt and pepper. Pour dressing over orzo. Mix in remaining ingredients. Season to taste with additional salt and pepper.